It’s that time of year again! Cranberry sauce and gravy time. They both serve opposite purposes on the plate, but I can’t imagine a slice of roasted turkey without both of these butting up against it. The other funny thing about both of these sauces is that they’re so often lackluster. 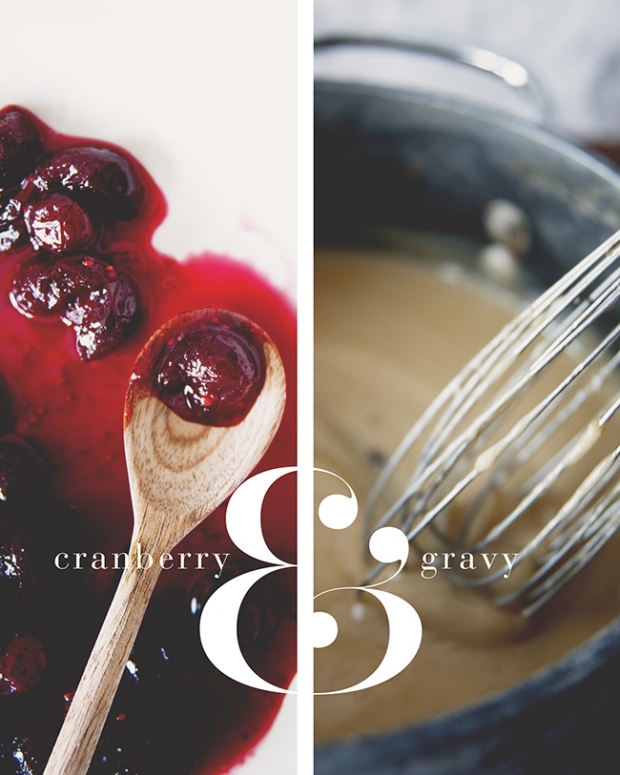 A bitter, thick cranberry sauce or a runny, less than flavorful gravy: neither of these things needed to happen. So to help you mix it up a little this year (but not too much, because tradition tends to be the expectation over the holidays), I have these two recipes for you: Red Ale Cranberry Sauce and a Classic Gravy. 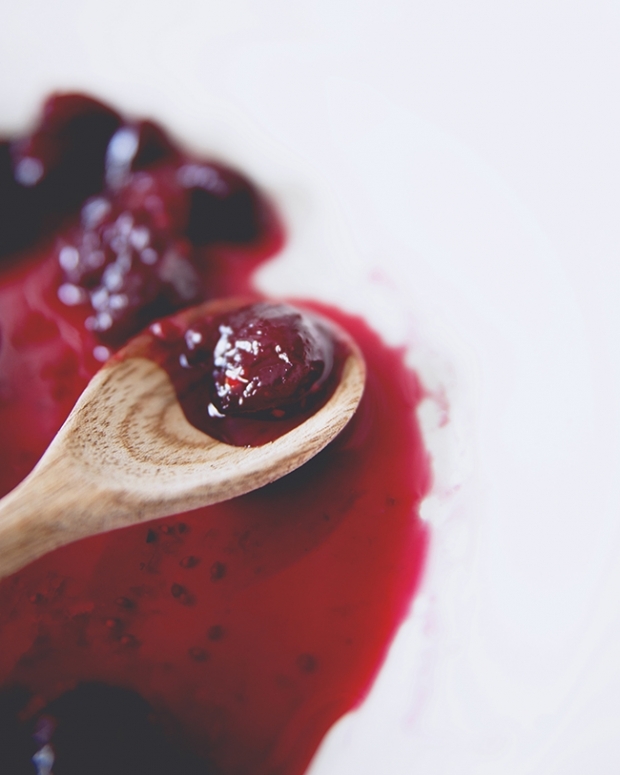 The cranberry sauce gets depth and tartness from Flemish red ale, a type of sour beer. If you can’t hunt it down, no worries, wine plus some balsamic vinegar does the trick. Classic gravy is made from drippings with a little thyme and brandy for extra flavor. Both can be made ahead of time and are super simple, so you’ll look super fancy when you bring these to the dinner this year. Enjoy! Bring ale (or wine and balsamic vinegar) and sugar to a boil, stirring until sugar is dissolved. Add cranberries and simmer, stirring every now and then, until berries just pop, 10 to 12 minutes. Stir in zest, then cool. 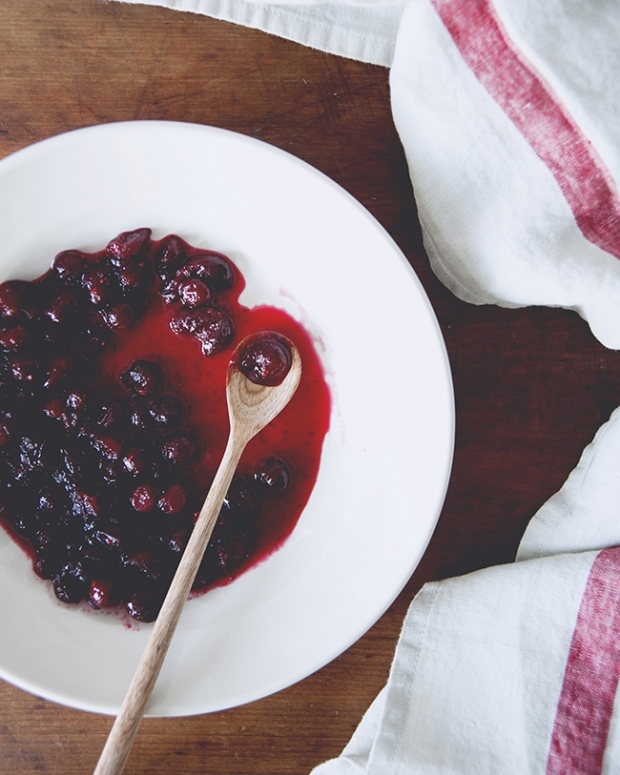 Be careful not to overcook, then you’ll end up with a cranberry jam rather than sauce. To make the drippings if you’re not already roasting a turkey or chicken, preheat the oven to 450F. Rub the turkey wings with oil, salt and pepper lightly, sprinkle with thyme, and put in a roasting pan or Dutch oven. Roast for 50-60 minutes, flipping once, until the wings are cooked through and a dark golden brown. Pour pan juices through a fine-mesh sieve into a glass or fat separator (do not clean roasting pan), then skim off fat and reserve. If there is less than 1/2 cup reserved fat, add melted butter to the fat. Add enough stock to the pan juices to total 4 cups liquid (1 quart), place the roasting pan or Dutch oven on a burner over high heat. Add about a cup of stock and the brandy (if using), and deglaze pan by boiling, stirring and scraping up brown bits, about 1 minute. Pour the liquid and brown bits from the roasting pan through fine-mesh sieve into a measuring cup (or bowl) with stock. 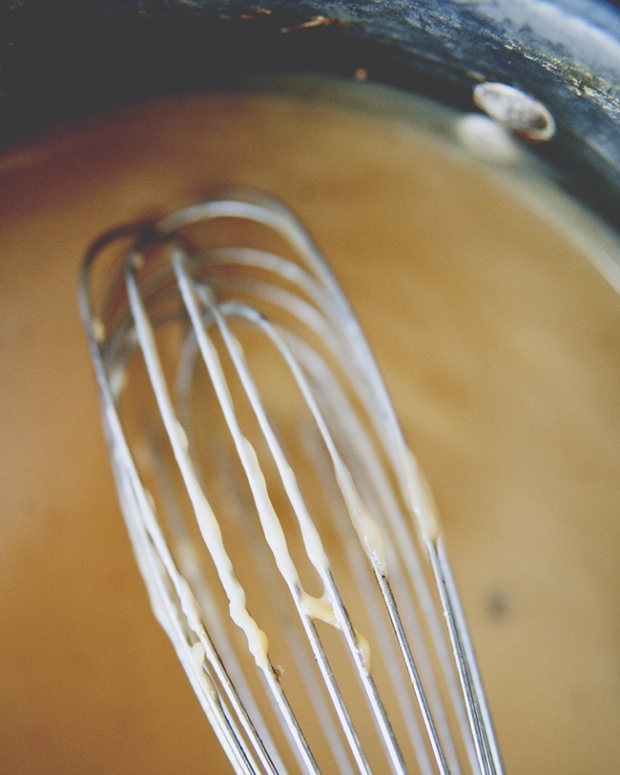 Whisk together reserved fat and flour in a 2-quart heavy saucepan over medium low heat, whisking for 5 minutes. 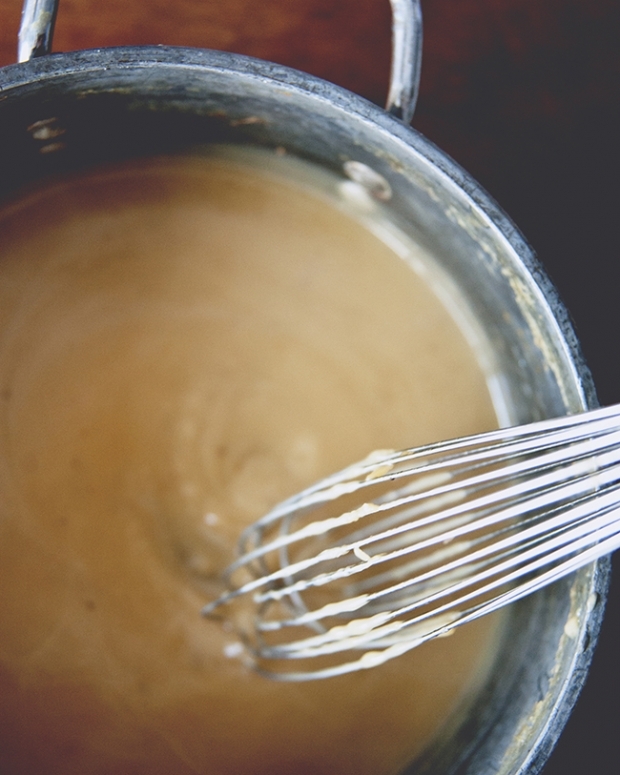 This is your roux, what the liquid will cling to to create a rich sauce. Add hot stock with pan juices in a stream, whisking constantly to prevent lumps, then bring to a boil, whisking. Simmer gravy until it has reached your desired consistency. Season with salt and pepper. Pour into a pourer to serve, or cool to room temperature and freeze for later use.